Enter [Micah Toll] and his Vruzend battery connectors, whose Kickstarter campaign has exceded its goal several times over. These connectors snap onto the ends of standard 18650 cells, and slot together to form a custom-sized battery pack. Threaded rods extend from each plastic cap to enable connection to a bus bar with just a single nut. The way that you connect each 18650 cell determines the battery pack’s voltage and current capability. There are a couple of versions of the connector available through the campaign, and the latest version 2.0 should allow some tremendously powerful battery pack designs. The key upgrade is that it now features corrosion-resistant, high-power nickel-plated copper busbars allowing current up to 20A continuous. A side benefit of these caps instead of welded tabs is that you can easily swap out battery cells if one fails or degrades over time. What would you use a custom battery pack for? The Vruzen team recommends electric vehicles, e-bikes, and DIY Powerwalls. Maybe a portable 3D printer, your own laptop battery, a high-power LED flashlight, or maybe a portable Raspberry Pi cluster or two? Or you could come full circle and make a battery-powered battery welder. [via electrek]. Thanks [Justin Monza] and [Jim Windgassen]. I wouldn’t trust those spring loaded clips in any sort of mobile application. There is a reason battery packs are welded, and it is that trying to put large amounts of current through a weenie spring loaded contact like that will quickly result in fried contacts. This is especially dangerous when you have intermittent contacts, because you end up with one charged cell (with a bad contact) surrounded by discharged cells, so when the pack cools back down and the contact reconnects you generate large amounts of current as the cells equalize which results in further contact degradation and possibly a battery fire. Throw in some corrosion (inevitable in a vehicle unless the battery is in an airtight container with desiccant pack) and I bet the pack won’t last through 1 winter. I also would love to see a youtube video of the first kid who drops one of the buss bars on across the wrong 2 cells and shorts out a cell group… Would probably be almost as good as the old hermaphrodite style ‘HXT’ connectors that allow you to plug 2 batteries into eachother in a ‘series/short’ configuration which results in either the connector vaporizing or the lipos exploding. I was thinking the same thing. With no tie between the two ends you are just asking for a connection that will weaken over time too. I like the idea of a modular battery system, but I don’t think this will hold up. A few strategic cableties would keep things from becoming loose. Hey, maybe if we starting flooding the comments with “+1” posts, HaD will let us have an upvote button. But an upvote counter might not be recognized by advertisers as traffic as easily as shear numbers of followup comments! If you put matching parentheses around all of the posts, I think you’ll find that there’s still an imbalance. I think it would be better if he used small neo magnets in the endcaps to maintain connection in all conditions. I have been using the magnetic battery connectors I designed for over 12 years now with no problems…well…one issue is that I have found a certain brand of 18650 battery that does not have any iron in the ends so the magnet does not attract, but all the rest I use do very well and stay connected no matter what. I predict a cascade failure: A marginal connection is resistive and with current will warm up, which softens the plastic leading to and ever more marginal connection which heats up even further, etc. Order batteries with solder tabs. They are only a few cents more per cell. If using secondhand cells, solder away. A 40W iron, sandpaper and flux makes it easy and doesn’t hurt the cell. Order batteries with solder tabs. They are only a few cents more per cell. If using secondhand cells, solder away. A 40W iron, sandpaper and flux makes it easy and doesn’t hurt the cell. Another thing to consider is voltage drop is considerable on spring contacts and screw on bush bars if your whole battery pack is built that way. This has to be done carefully and periodically checked in a high current application. If I have to do this, I would at least use a strong soldering iron or soldering gun (80-100W) you do not want to fry the cells on low heat, you want to heat the connection as short (fast) as possible. Rinoa Super-Genius uses a really big soldering iron intended for sheet metal work. Because those are hard to find nowadays, I use a 260W Weller soldering gun for assembling battery packs. Careful what you solder. Some lithium chemistries go to thermal runaway at 165 C so just getting the end hot enough to melt the solder can start a chain reaction that blows up the cells. I dont understand, why are we talking about 1000$ for a spot welder when you can get one for 150$ delivered to your home on AE? if you press the button without welding something, I think you’re going to have a bad time before long as the battery will be shorted through the relays coil. A starter relay will be designed for at least a few seconds of continuous operation. This would give much more consistent results with a repeatably timed pulse, though, maybe with an adjustable duration for different thicknesses or materials. A 555 with a potentiometer would do the job perfectly, so expect the next project here to use a Raspberry Pi for it. So all the current is passed through a spring loaded tab that’s only held there by the force of friction between the cell and the plastic cap? I wouldn’t recommend using that in any corrosive and vibration heavy environment like a skateboard or e-bike. Don’t be stupid and just use a spot welder. $1000? Mine was free from an old microwave oven. You can also use car batteries to spot weld. Is anybody has a clue, where to source connectors used in cordless power tools? I build a product that uses a standard brand-name cordless powertool battery. 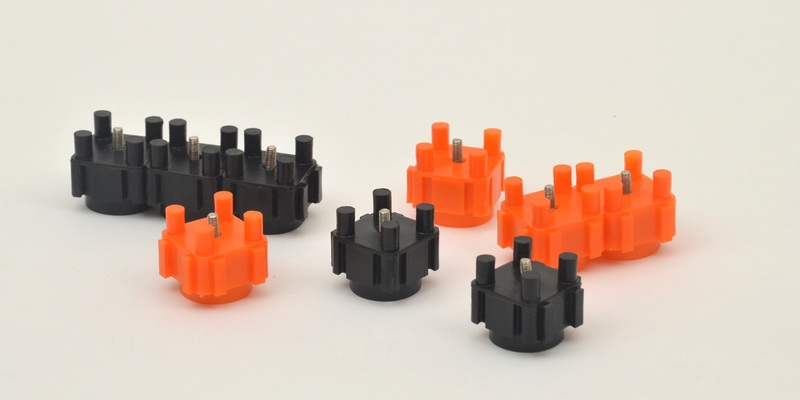 We buy the mating connectors (tool side) through the manufacturer’s service centers. Took a bit to chase down part numbers, but cost is about $1 in 50 qty. We also have an accessory power supply (mounts like the battery), that one we had to build from scratch. Not going to lie, you made me super curious about what product you build. That is a great idea that I wouldn’t think was feasible. could you start building battery adapters please, for example snap on have an 18v nicad line (old stuff but mine all works great) and a 18v lithium line which in buying into but some tools I don’t see me ever replacing from the old set due to only occasional useand the nicad batterys I have are getting weak, im using me as an example but im sure this is something that would actually sell.. If you google “power tool battery adapter” you’ll find many varieties. I’ve also seen several printables on thingiverse. Most tool and battery suppliers want nothing to do with the idea as they are adverse to the risk of liability. I wonder what sort of insurance this guy has ? (for the inevitable lawsuits after someone burns their house down from messing with this “invention”). He should adopt the shady home contractor model (seems they can reinvent themselves each time and avoid paying out any money for shoddy work). I have one of these kits from the previous version. I used it to make an ebike battery. Worked great. The caps are surprisingly tight and stay on well, though they recommend adding heat shrink or something to add compression just in case. Also the springs aren’t like thin coils, they are thick leaf springs so it’a pretty strong IMO. I really love a contact spring which works against friction. Like in the “good” old cigarette lighter plug. If you have some vibration or motion or less then perfect precision of the parts it will fail. Very cool, I jumped on their kickstarter I have many DIY projects this could be odne for. I hope this works out, it would simplify projects a great deal. Very good article; very informative comments. c) the hyperlink at the beginning of this article. You’ll be able to amaze your friends. Or make friends. Or enemies (who know more than you do). I’ve been building a DIY power wall for just over 2 years now, and have processed roughly 2000 18650s, I tried the Vruzend kit, and the problem is in larger packs they don’t like to stay together. If your project uses less than 30 cells it’s probably fine, but once you move too larger packs of cells say 7S80P it’s no good, and cost prohibitive. The 4×5 18650 holders that are dirty cheap from China are an order of magnitude better, and you can design your own bus system that isn’t tons of tiny strips and nuts. What we’re missing here are big, frankenstein style lug bolts. Should provide a stong enough hold and large surface area for connection. If it clamps in the battery, then you just replace the clamp (and battery) if you’re hot-swapping to charge it, might make for a useful quick-release and rapid-replace system for prototyping. Can you take two separate packs with the same battery configuration and put them in parallel to double the amp hour? It bothers me as an EE feeling one pack will feed into the other or maybe they just level each other out. He spends quite a bit of time exploring that exact concern. Good source for 18650? They are widely different in pricing. Where do you all like to buy them? I just bought 130 18650’s 3500mAh from dhgate.com arrived in the week, and I’ve just checked the voltages, 90% were 3.85-3.86 a couple down to 3.83 and half a dozen up to 3.92. Have managed to check current output or capacity yet. But pleased so far. Oops typo: should’ve read “Haven’t managed to check current output or capacity yet. But pleased so far.